Generally split into two groups – summer and winter – squash is a group of vegetables that are fleshy on the inside and protected by a hard rind on the outside. 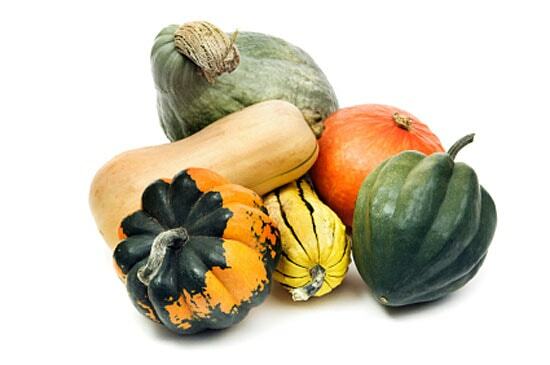 The most common varieties are pumpkins, zucchinis, acorn squash, and butternut squash. These colorful fall favorites are loaded with Vitamin C, Vitamin A, and fiber. With many varieties offering distinct flavors, squash is an excellent addition to soups, pastas, and chilis that can help keep you warm on those cold late-autumn days. Squash has been a staple part of the North American diet since long before Europeans arrived, and it’s easy to see why. Easy to store and prepare, squash provides a simple way to add vitamins and extra fiber to every meal. Just one cup of baked winter squash provides more than 100% of the daily recommended value of Vitamin A (in the form of beta-carotene), and 25% of the daily recommended value of fiber. The beta-carotene in squash is a powerful antioxidant and has anti-inflammatory properties. That’s a lot of nutrition packed into only 115 calories. Add squash to your favorite pasta recipe – or make it the feature by tossing with pasta, olive oil, and parmesan cheese. Puree roasted squash with onion, vegetable broth, and a little low-fat milk to make a warm, hearty soup. Top a salad with roasted squash for a warm nutrition kick.Add a cup of roasted squash to your favorite waffle recipe to make savory waffles. Puree cooked squash and top with a drizzle of maple syrup for a healthy dessert. Use the noodle-like inside of spaghetti squash instead of pasta. Dust with chili power and olive oil and roast in the oven for a tasty side dish.